However, when the archangel Michael had a dispute with the Devil, debating about the body of Moses, he did not dare to deliver a judgment in abusive terms, but said: May the Lord rebuke you! In reality, he is nobody else than Elohim's Son Yeshua. However, in his spiritual, heavenly state he is introduced to us as Michael, as is the case in 1 Thessalonians 4:16 >> For the Lord himself will descend from heaven, with a commanding call, with an archangel’s voice, and with God’s trumpet, and the dead in Messiah will rise first. Although the phrase with an archangel’s voice has the genitive, the article is lacking. 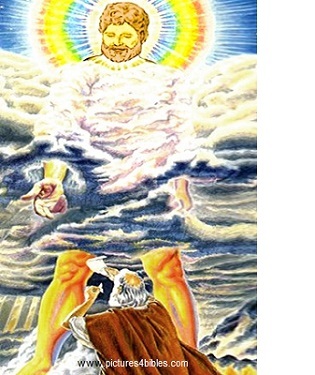 For that reason, some believe that the Lord can not be identified with Michael. But then the voice of the Lord would have less authoritative power than the archangel’s voice. 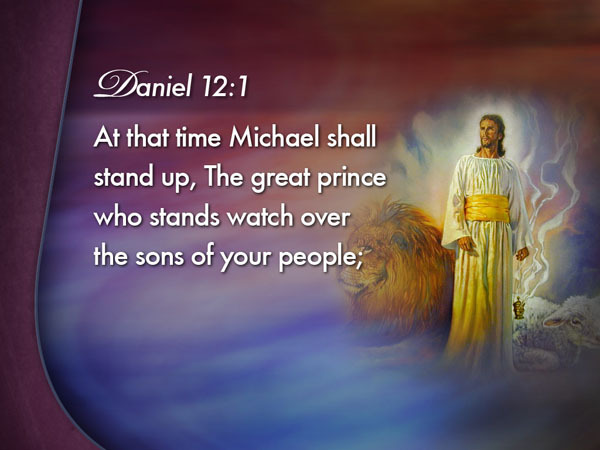 At that time Michael shall stand up, the great prince who stands in behalf of the sons of your [Daniel’s] people; and there shall occur a time of distress, such as never was since there came to be a nation even to that same time: and during that time your people shall escape, everyone who shall be found written in the book. A comparison with Dan 11:20-21 teaches us that this "stand up" has the meaning become king. The scope of the term corresponds to what is stated in Dan 2:44 and 7:14 about the coming in his kingdom of the Son of Man. And she gave birth to a son, a male child who is to shephard all nations with a rod of iron; and her child was caught away to God and to his throne… And war occurred in heaven. Michael and his angels waged war with the Dragon. And the Dragon and its angels waged war, and it had not strength, nor was found place anymore for them in heaven. And the great dragon was cast out, the ancient Serpent, who is called Devil and the Satan, the deceiver of the whole inhabited earth - he was cast into the earth, and his angels were cast with him. And I heard a loud voice in heaven, saying now occurred the salvation and the power and the kingdom of our God and the authority of his Messiah, because the accuser of our brothers, who accuses them day and night before our God was cast. And they overcame him by reason of the blood of the Lamb and by reason of the word of their testimony, and they did not love their soul unto death. The heavens and those who have their residence there, be glad for this. Woe for the earth and the sea! Because the Devil came down until you, having great fury, knowing that he has short time. It is very obvious that the king himself is leading the heavenly battle and in that commanding his angels. Here, that role is clearly attributed to Michael. Compare also Two Thess 1:7-8, where is described the future judgment on people on earth, but in which the heavenly Yeshua (Michael) also directs his angels: At the revelation of the Lord Jesus from heaven with his powerful angels, in a flaming fire, as he brings vengeance upon those who do not know God and those who do not obey the gospel about our Lord Jesus. In Matthew 16:27 and 25:31 we read repeatedly that Yeshua will come gloriously into his Father’s kingdom, accompanied with his angels. So, in that respect Yeshua and Michael are interchangeable. In the heavenly places, especially in his fight against the demons, the Son of God is referred to as Michael, but in the earthly sphere he is the Lord Yeshua, Elohim's Son. As we saw in Daniel 12:1, Michael appears there as the great prince who stands in behalf of the sons of your [Daniel’s] people. Other parts of the Tanakh tell us that he, in that capacity and prehuman existence, accompanied the people of Israel on their journey through the wilderness, on the way to The Land of Promise. As the angel of YHWH Elohim he went in front of the people. Consequently, it was a matter of course that this very angel got a dispute with the Devil about burial of Moses' body, as we recalled above: When the archangel Michael had a dispute with the Devil, debating about the body of Moses, he did not dare to deliver a judgment in abusive terms, but said: May the Lord rebuke you! Yahweh went ahead of them by day in a pillar of cloud, to lead them on their way, and by night in a pillar of fire, to give them light that they might go by day and by night. The pillar of cloud would not move away before the people by day, nor the pillar of fire by night (Ex 13:21-22). Compare also Ex 14:19, 24; 23:20-23; 32:34. And let all the angels of God honour him. However, from this passage cannot be derived that the Son could not possibly belong to YHWH Elohim's angels. He simply is the first among all the other angels who too are sons of God, also referred to as morning stars (Job 38:6-7). By virtue of his prominence among them, he is the archangel. Consequently, the angels are in a very different position than Yeshua. He is the chief of the angels, for we read repeatedly that he - Yeshua, the Son – is coming with his angels, as we observed earlier in Matthew 16:27; 25:31 and Revelation 12:7. You are my son. Today I have become your father. Ask of me, and I will give the nations for your inheritance, the uttermost parts of the earth for your possession. Sit at my right hand until I have your enemies put a footstool of your feet… You are a priest forever, after the order of Melchizedek. And I saw an angel coming down out of heaven with the key of the abyss and a great chain in his hand. He seized the dragon, the old Serpent, who is the Devil and Satan, and bound him for a thousand years. And he cast him into the abyss and shut it and sealed it over him, so that he would not mislead the nations anymore until the thousand years were ended. After this he must be released for a little while. And I will put enmity between you and the Woman, and between your seed and her seed; he shall bruise you in the head, and you shall bruise him in the heel (Gen 3:15). With the Seed of the Woman that will bruise the Serpent’s head, Yeshua was prophetically indicated. Logically therefore that we see him here in action against the Devil, that old Serpent, taking away his freedom of movement. Afterwards, at the end of the thousand years, he will totally annihilate him (Rev 20:7-10). And as for me, in the first year of Darius the Mede, I stood next to him [Michael] as support and stronghold. The first year of Darius the Mede (the Darius of Dan 5:31) was 539-538 BC. His first year was associated with the fall of Babylon in 539 BC. And the one who is speaking here is probably Gabriel, another prominent angel. Obviously, during that crucial period of time for the Jews, Gabriel was at Michael’s side to assure the preservation of the Jewish Remnant against the demon-prince of Persia. Thus, he supported Michael in safeguarding Jewish interests; of course, entirely according to Elohim's purpose for his chosen people. Gabriel's statement in Dan 11:1 refers to an event which had taken place two years earlier in his close cooperation with Michael. For that reason it constituted only a brief interruption in the report that already started in Daniel 10 and is continued to the end of the Book, all relating to Daniel's last vision. According to Daniel 10:1, Gabriel - in the third year of Cyrus king of Persia, i.e. the year 536 BC - had made contact again with Daniel as he had done before, according to Daniel 8:15-19 and 9:20-23. Concerning Daniel’s last vision, in the Bible Commentary of Jamieson-Fausset-Brown we read: “The tenth through twelfth chapters more fully describe the vision in the eighth chapter by a second vision on the same subject, just as the vision in the seventh chapter explains more fully that in the second. The tenth chapter is the prologue; the eleventh, the prophecy itself; and the twelfth, the epilogue. The tenth chapter unfolds the spiritual worlds as the background of the historical world, and angels as the ministers of God's government of men. In the year 536 BC. Gabriel was again sent from heaven to Daniel to convey the prophetic message how it would fare with the world power of that time (Persia) and the subsequent empires (Greece and Rome), right to their very end. However, the demonic spirit-prince of Persia had made every effort to thwart the mission of Gabriel. In a last desperate attempt the demon offered resistance against a revelation from God in which the downfall was announced of the Empire under his supervision; perhaps in the vain belief that, with his action, the execution of God's plan could be prevented. Anyway, no less than three weeks, that Persian demon-prince succeeded to stop Gabriel in the execution of his mission. However, when Michael came to his aid he was able to reach Daniel with the important message for God's people (Dan 10:12-14, 20-21). In Dn 10:2-9 Daniel is telling us how he personally experienced the said three weeks. Apparently, on the basis of reports that had reached him from Jerusalem, he continually mourned and fasted. The returned exiles had responded to the decree of Cyrus to rebuild their temple which had been destroyed by the Babylonians in 587 BC (Ezra 1:1-4). When they returned to Jerusalem the altar was indeed set up again and the foundation for God's house was laid (Ezra, chapter 3). But the neighbouring Gentiles had come in opposition to the project and devised difficulties for the returning Jews (Ezra 4:1-5). Apparently, Daniel was very concerned about those developments: the heathen peoples weakening the hands of the people of Judah, and so troubling them in their efforts. In the four and twentieth day of the first month, as I was by the side of the great river, which is Hiddekel, I lifted up my eyes, and looked, and, behold, a man clothed in linen, whose thighs were girded with pure gold of Uphaz. And his body also was like the beryl, and his face as the appearance of lightning, and his eyes as flaming torches, and his arms and his feet like burnished brass, and the voice of his words like the voice of a multitude. I, Daniel, alone saw the vision; for the men who were with me didn’t see the vision; but a great quaking fell on them, and they fled to hide themselves. So I was left alone, and saw this great vision, and there remained no strength in me; for my comeliness was turned in me into corruption, and I retained no strength. Yet heard I the voice of his words; and when I heard the voice of his words, then was I fallen into a deep sleep on my face, with my face toward the ground. In Revelation 1:12-17a, in corresponding phrase, Elohim's high priest Yeshua, his Son, is described by his apostle John, who was seeing him in visions among the Jewish End time community, typified by the seven golden lampstands. We must therefore conclude that Daniel at that time had a vision of Yeshua Masjiach in his pre-existence. But that leads to the following question: How is that man, dressed in linen, identified in the context of the report of Daniel 10 ? Apparently, in that experience, Daniel had an impression of the mighty archangel Michael, the Prince of his people. Daniel himself tells us how he fared further: I heard his voice, but as soon as I heard I lost consciousness and fell to the ground. But then, from verse 10, another character appears: And, behold! there was a hand that touched me, which stirred me up on my knees and on the palms of my hands. Who was that man? He must certainly have been Gabriel, the only other spirit-prince who is being named in the Bible. During those three weeks, it was after all Gabriel who, by the efforts of the Persian demon-prince, was stopped in his mission to reach Daniel. But when Michael came to his aid he could continue his way with the important message for Elohim’s people (Dan 10:12-14, 20-21). One said to the man clothed in linen, who was above the waters of the river, How long shall it be to the end of these wonders? I heard the man clothed in linen, who was above the waters of the river, when he held up his right hand and his left hand to heaven, and swore by him who lives forever that it shall be for a time, times, and a half; and when they have made an end of breaking in pieces the power of the holy people, all these things shall be finished. I heard, but I didn’t understand: then said I, my lord, what shall be the issue of these things? He said, Go your way, Daniel; for the words are shut up and sealed until the time of the end. Many shall purify themselves, and make themselves white, and be refined; but the wicked shall do wickedly; and none of the wicked shall understand; but those who are wise shall understand. In the foregoing, we found that Michael is identical to the angel of Yahweh. About both we read that they stood aside Elohim's people Israel, especially during the Exodus. In the End tmes, during the 70th Annual Week for Israel, when Michael "stands up" to be the messianic king - in God’s messianic kingdom which then actually is in action - that will be the case again. Just compare Daniel 2:44; 7:13-14; 12:1 (above: The Lion out of the tribe of Yehudah) and Revelation 12:7-10. In addition, see Daniel 9:24-27. Since YHWH Elohim and his only-begotten Son, Yeshua, are one in purpose and concern for the "sheep", the Son, in his pre-existence, of course was closely involved in Yahweh's people, the Israelites; as well as with their forefathers: With Abraham and his seed (John 10:27-30). In the situation of Genesis 16:7 we see him for the first time appearing as Yahweh's angel, making contact with Hagar, who had run away from her mistress Sarai. Gen 16:7 is also the first place in the Bible where the word angel appears. b. Elohim was on the verge of executing a devastating judgment to the whole district of Sodom. See some passages from Genesis 18 and 19. 18:1-2 >> Yahweh appeared to him by the oaks of Mamre, as he sat in the tent door in the heat of the day. He lifted up his eyes and looked, and saw that three men stood opposite him. 18:16-17 >> The men rose up from there, and looked toward Sodom. Abraham went with them to see them on their way. Yahweh said, “Will I hide from Abraham what I do? 18:22 >> The men turned from there, and went toward Sodom, but Abraham stood yet before Yahweh. 18:32-33 >> He said, “Oh don’t let the Lord be angry, and I will speak yet but this once. What if ten are found there?” He said, “I will not destroy it for the ten’s sake.” Yahweh went his way, as soon as he had finished communing with Abraham, and Abraham returned to his place. 19:12-16 >> The men said to Lot, “Do you have anybody else here? Sons-in-law, your sons, your daughters, and whoever you have in the city, bring them out of the place: for we will destroy this place, because the cry of them is grown great before Yahweh. Yahweh has sent us to destroy it.” Lot went out, and spoke to his sons-in-law, who were pledged to marry his daughters, and said, “Get up! Get out of this place, for Yahweh will destroy the city.”… The men laid hold on his hand, and on the hand of his wife, and on the hand of his two daughters, Yahweh being merciful to him. 19:24 >> Then Yahweh rained on Sodom and on Gomorrah sulfur and fire from Yahweh out of the sky. Thus, "Yahweh" appeared to Abraham, but it is clear that "Yahweh" was the angel of Yahweh. YHWH Elohim's deep commitment to Abraham and his "seed" appears, as noted earlier, also from the report on the Exodus. As the angel of Yahweh he went along with his chosen people, but to the reader the message is coming across as if Yahweh and his angel are the same ‘persons’. Behold, I send an angel before you, to keep you by the way, and to bring you into the place which I have prepared. Pay attention to him, and listen to his voice. Don’t provoke him, for he will not pardon your disobedience, for my name is in him. Because of his extensive involvement in the affairs of God's people Israel, it is a matter of course that precisely this angel, the angel of Yahweh, contended with the Devil about Moses, Israel's leader. And as we noticed already, as is revealed in Jude 9, that angel was the archangel Michael, none other than God's most principal Son. Considering the theme of this study – Michael, the archangel, in conflict with Satan's Empire - Joshua 5:13-15 is of special interest. He lifted up his eyes and looked, and, behold, there stood a man over against him with his sword drawn in his hand: and Joshua went to him, and said to him, Are you for us, or for our adversaries? He said, No; but I have come now as commander [Hebrew: sar; prince] of Yahweh’s army. Joshua fell on his face to the earth, and did worship, and said to him, What says my lord to his servant? The prince of Yahweh’s army said to Joshua, Put off your shoe from off your foot; for the place whereon you stand is holy. Joshua did so. Based on all the above, some make the mistake equating the Son of God with Yahweh, his God and Father. However, in reality there is only one Yahweh, the Almighty God. That statement reminds us of Yeshua's prayer that he - on the evening before his death - addressed to his Father: Father, the hour has come; glorify your Son, that your Son may glorify you, just as you gave him authority over all flesh, that to whatever you gave him, he may give them eternal life. And this is life eternal, that they might know you, the only true God, and him whom you sent forth, Yeshua Messiah. Only YHWH, the Father, is the Supreme God. His Son, which he sent, is clearly distinct from Him. Yahweh alone, the Most High, is the God of his people Israel: For I am Yahweh your God, the Holy One of Israel your Saviour (Isaiah 43:3).